puncturesafesouth has no other items for sale. Don't know your tyre pressures?. The Tyre Pressure Monitor reduces the unwanted task of having to check your tyre pressures at a petrol station (often queuing);. Correct tyre pressure saves fuel, money and reduces emissions. There are 414 items available. Please enter a number less than or equal to 414. Fast delivery and item exactly as described. Great seller,fast response and item as described,would recommend to all,thanks. My car has factory fitted tyre pressure monitors but my caravan does not. Because I wanted a way of quickly and easily checking the caravan tyre pressures without having to use a pressure gauge I looked around for a better solution. I found that solution in these valve caps. 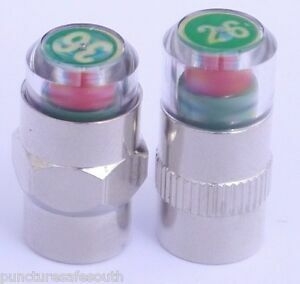 I needed caps set to 46psi and as soon as I fitted them the indicator on the top showed green. I now only have to look at the valve caps to see if the caravan tyre pressures are correct. If the pressure drops the indicators will show a yellow warning and if the pressure drops too low it will show red. Once the tyre pressure is corrected the valve indicator will return to green. An excellent safety and time saving piece of equipment. They are a good idea, but they are just too fragile. One clip of the kerb and down goes your tyre. I hope you carry a pump with you, if you buy any. I tried 3 of these before I gave up and went back to good old dust caps and the last 2 times I know I didn't hit any kerbs?? The body is metal, good, but the top is plastic, bad. Not sure how this can be overcome tho. Good in theory, but not so good in practice, sorry. These are really great at saving you time from checking your pressures all the time, Now I just walk around the car and visually check the pressures, what a great idea. Beware I have done some homework and there appears to be a lot of cheap ones on the market with bad reviews but these appear to be well made and have had no problems. Excellent no more grubby knees and fingers doing Tyre pressure checks.